Vandas are native to Southeast Asia. Most varieties prefer bright light and warmth as well as a reasonable degree of humidity. These plants are known for their large flower size and vibrant colors. Vandas are grown in teak baskets or in pots. For most household conditions, pots are best because they hold more moisture around the roots. Teak baskets are really best suited for high humidity areas such as greenhouses, or growing chambers or outdoors where they could be wetted or misted every day. Plants in pots should be watered just as the medium dries out, approximately every 5-7 days for larger clay pots. It is best to use rain, distilled or reverse osmosis water. For tap or well water, fertilize at full strength every other watering. Feed with Grow More 20-10-20 at 1 tsp. per gallon. Most Vandas grow on treetops on ridges along rivers and prefer bright light. When growing indoors a south window exposure is best. If growing under lights, L.E.D. Grow Lights provide adequate light to promote flowering 2 to 3 times per year provided the plant has reached a mature size. Vandas can be grown outside in the summer (or all year long depending on where you live) as long as the night temperatures are in the upper 50's (degrees Fahrenheit) or above. Grow under dappled sunlight such as a shade tree or an evergreen. Gradually they can be exposed to brighter light. Vandas require warm temperatures except for vanda coerulea and some of its hybrids. Daytime temperatures in the 70's to 90's are ideal, with night temperatures in the low to mid 60's. Try to maintain 50% and above. If provided enough humidity, Vandas can be grown without any potting medium whatsoever. Many times Vandas will be shipped from overseas where they have been grown in high humidity environments, therefore being grown bare root in the basket. The ideal household does not provide enough humidity to keep Vandas growing well in bare root condition. We recommend that you lightly pack New Zealand sphagnum moss around the roots to provide moisture to the roots. Vandas can flower at any time of year. The heaviest flowering season is between spring and fall. Slightly cooler temperatures and bright light initiate flower spikes. Keep the mix moist when the plant initiates buds or starts flowering. If the top of the buds become glued together with a clear, honey-like substance, try misting the bulbs to dissolve this sugary secretion. They should open normally. 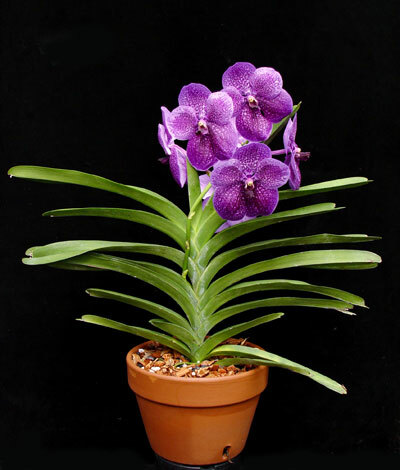 Vanda flowers are large with thick substance, and can bloom for one to three months at a time. Vandas in teak baskets can remain as is for many years, developing longer root systems as time goes on. Vandas in pots should be potted in coarse charcoal or bark, as their roots require ample air. Repotting should be done every 2 years or as the root system expands above the pot. After repotting, keep the plant a bit on the dry side for the first couple of weeks as this allows any cracked roots to heal. Vandas prefer clay pots as they breathe better than plastic. If your plant is growing in a teak basket and you can't keep it wet enough, simply tuck the root system, teak basket and all, into a new clay pot, and fill in with charcoal.